Mistletoe, dreidels, Father Christmas, and twinkly stars on the tops of trees. Don’t you love this most wonderful time of the year? 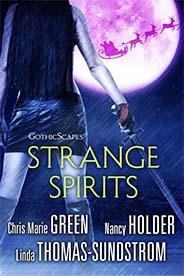 But there’s also a darker side to the holiday season – and renowned paranormal authors Chris Marie Green, Nancy Holder, and Linda Thomas-Sundstrom, have put some scary merrymaking into stories about STRANGE SPIRITS who might not believe in putting the “happy” in the holidays. Into the Storm: a witch tries to keep Christmas in the middle of a violent, time-travelling war. In Bad Spirits: a mysterious entity stalks a monster hunter on Dawn Madison’s team, and they’re about to learn that hell hath no fury like a woman scorned! Hot Holiday: the Dark Side has put a hit out on Santa Claus and sent a Recruiter named Wanda to seal the deal. STRANGE SPIRITS are gathering for the holidays. . .